On September 18th, the Vietnam Software and IT Services Association (VINASA) held a ceremony to award Vietnam’s 50 Leading IT Companies in 2018. This award has been annually held by VINASA since 2014 with the aim to honour prestigious, proficient and leading Software development companies in the Vietnamese technology industry while promoting cooperation with international partners. Vietnam’s 50 Leading IT Companies 2018. According to VINASA’s report, in 2017, revenue from software development services in Vietnam reached over $6 billion, software outsourcing revenue reached over $1 billion, while the global IT markets are valued at over $700 billion (according to Statista 2018). In 2014, Savvycom was honoured for the first time in the Top 30 Software development companies in the line of BPO, ITO and KPO. This September, Savvycom has made its second appearance on the list due to the impressive growth and significant achievements. At the beginning of 2018, Savvycom took a breakthrough in the race to ‘Industry 4.0’ by cooperating with the University of Engineering & Technology, Vietnam National University to launch the AI Lab, which specializes in the research and development of Artificial Intelligence applied in software development processes. 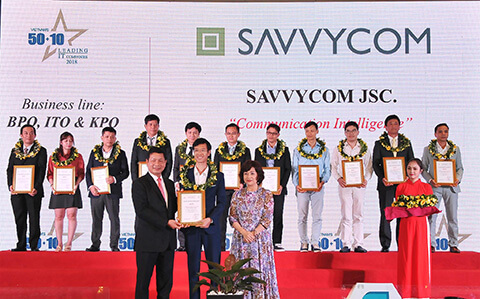 Ms Van Dang, Savvycom’s CEO, said: “With the general goal of making Vietnam become a prestigious technology leader on the world map, Savvycom always has a high appreciation for values of professionalism, strengthens the services, becomes long-term strategic partners and simultaneously establishes a strong IT community in Vietnam. In addition, the company also strives to build an international network that not only expands the horizon of business opportunities but also creates a resourceful learning circle among leaders across various fields of business. Founded in 2009 and run by Ms Van Dang – a talented and ambitious woman entrepreneur, Savvycom has been constantly striving to become a trusted partner to international enterprises and organizations, aiming at the global goal in the field of software development services. After nearly 10 years of development, Savvycom has listed itself on Clutch’s Top 30 Global App Developers and Top 25 IT Outsourcing Companies. Ms Van Dang, CEO of Savvycom is also one of the speakers at TEDx and many other national and international events, listing herself at no.3 of Top 15 Global Leaders must watch in 2017 on Forbes.